I hope all the moms have a wonderful day with their families. We're having a relaxing one here. My dad, brother and grandparents are coming up for dinner. So now I need to clean up the house that has been seriously neglected this last week! This is so pretty! I love the color scheme! Your card is very pretty. Love the Sassy Strands around the vase. Happy Mothers Day. this card is great! I love the colors and the design. so very cheery and pretty! 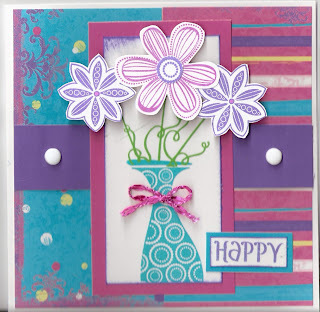 This card makes me think that I need to order Whoops a Daisy now. I saw it in person for the first time the other day, and I really like it. Beautiful! TFS! Your card is gorgeous! Hope you had a great holiday! Love your card. That stamp set is to cute. LOVE THE COLOURS ON THIS ONE NIC!